Like many other visitors that day, I was looking forward to finally witnessing the grandeur of Ha Long Bay, but the weather not in our favor and the anticipated scenic view of limestone islets and emerald waters of the Gulf of Tonkin was replaced by a low visibility, gloomy, cold winter morning. Travelling independently from Hanoi to Halong Bay can be a tedious ordeal due to uncertain public bus schedules, resulting to a significant rise of tour operators offering full day package of bus transportation to and from Hanoi, a cruise trip and a free lunch. Though joining the tour is the most guaranteed approach, but there are more situations where the cons outweighs the pros, like the jam-packed mini bus we need to endure for the 3 hours uncomfortable bus ride from Hanoi. 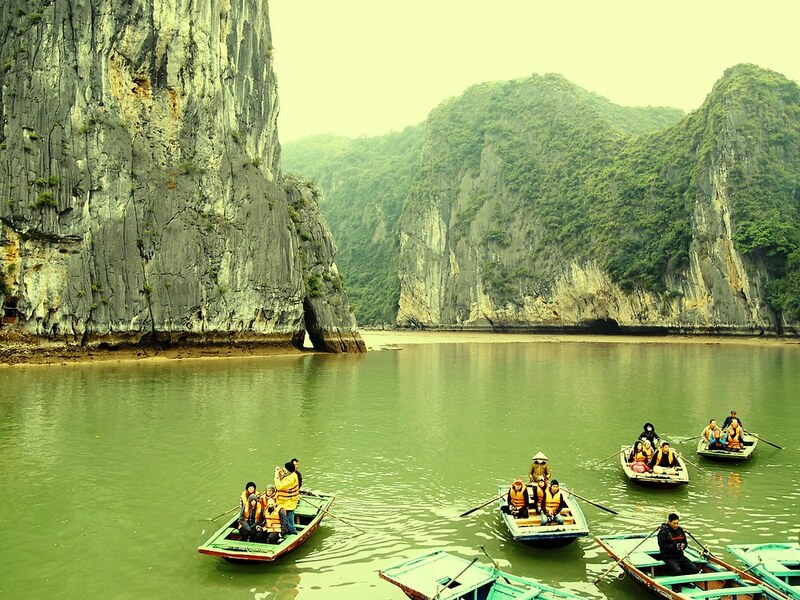 Regardless of the weather, the UNESCO World Heritage Site Ha Long Bay is a major tourist draw and the batches of eager visitors arriving at Ha Long wharf were increasing every minute. It is important to remember your boat name and number, since all boat looks exactly the same and completely different from the brochure presented to you at the travel agent prior booking the tour. A visit to Thien Cung Cave (Heavenly Palace Cave) is part of the day itinerary and the first one visited, a few walks from the dock area requiring a few steep steps towards the mouth of the cave. I always though that cave natural rock formations are a fascination as it is and there is absolutely no need to use weird disco style lighting to attempt to further emphasize its beauty which actually accomplished the opposite. 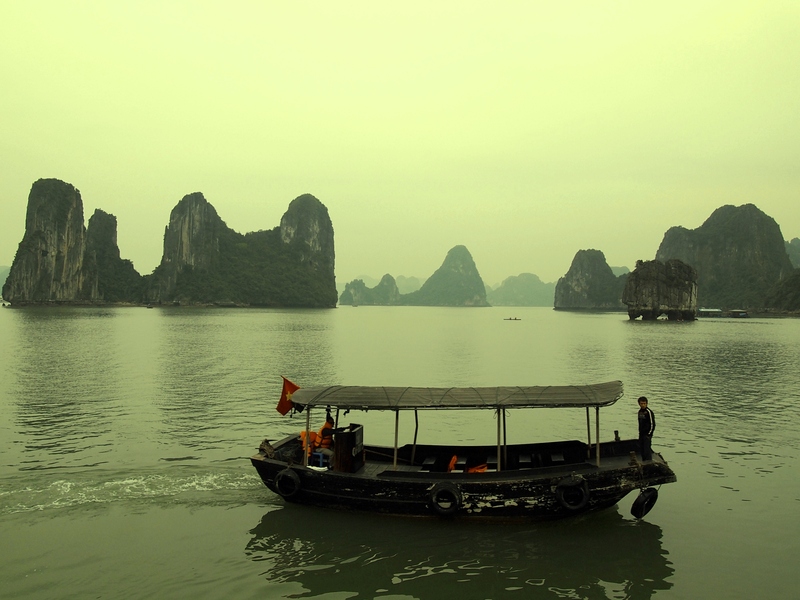 When we started to move around the small islands is where I started to appreciate the mystical beauty of Ha Long Bay. The close up view of limestone karsts and the distant ethereal panorama of many more islands waiting to be explored is how I always vision Ha Long Bay despite the unavailability of blue sky and perfect summer breeze. If I have my way I will just continue to sail across each island, until I found that mystical dragon said to be living in the bay according to local legend. But I am part of the tour and I must join the rest as we made our way towards a small floating village. The rest of the day was spent at this spot where most tourist are encouraged to explore the bay with kayaks and boat rides at their own expense. 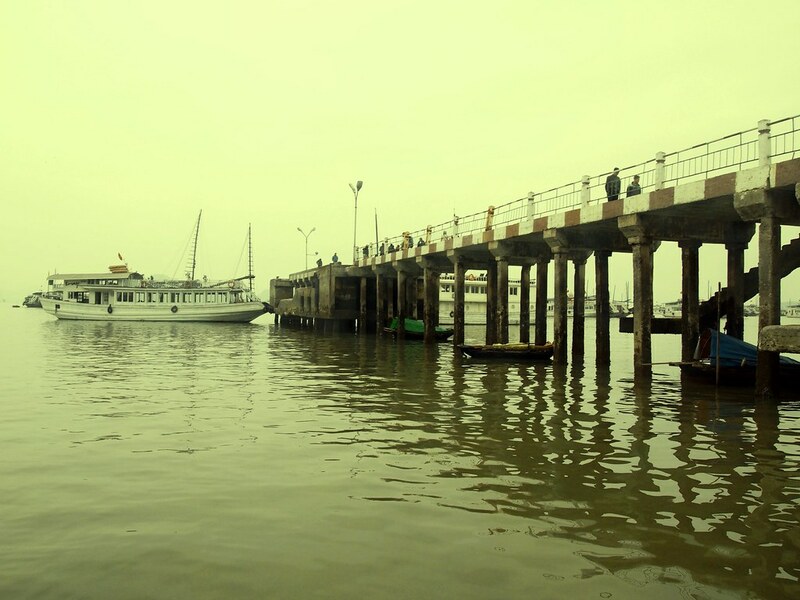 As we depart Ha Long Bay, I decided to endure the cold breeze and sit at the roof deck of the boat, with an unsatisfied feeling of knowing that there are more yet to be seen. Maybe next time, maybe when the weather is better, maybe when there are available alternative ways to reach and enjoy Ha Long Bay.